Tuesday’s wide spread up candle for the usd to cad pair promised much, but yesterday’s long legged doji signalled that this was simply a short squeeze move, and as such was only a temporary reprieve for the usd to cad pair. 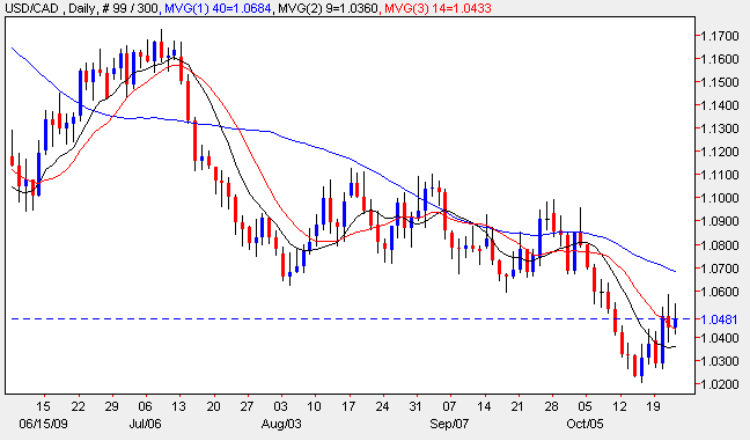 Indeed this had already been signalled to some extent by the closing price of Tuesday, which found resistance at the 14 day moving average, suggesting that the move had little in the way of momentum and was likely to be snuffed out very quickly. Yesterday’s doji candle would seem to confirm this view, pointing to a market that is indecisive once again and therefore likely to turn lower once again and continue the long slow slide towards 1.00 once again. With strong resistance now above, and with very little in the way of support below, there is only one way for the usd to cad currency pair to travel at present, and that’s due South once again. The question now of course is whether the downwards spiral will stop at parity of move below this psychological level, and given the parlous state of the US dollar, anything is possible at present. Today of course saw yet more bad news for the US economy with the release of the weekly unemployment claims which came in worse than expected at 531,000 against a forecast of 516,000 and higher than last week’s 520,000, so the prospect of any interest rate decision from the FED has receded once again. For Canada, the main item of fundamental news on the economic calendar was the Bank of Canada Monetary Policy Report followed by the BOC press conference 45 minutes later, and as always any market reaction is likely to occur during the question and answer session which follows, when unscripted questions often lead to unscripted answers! !